Let’s start with a chart from my last post. I’ve relabelled it to read ‘sales capacity’ adds rather than ‘production capacity’ adds just because we can then tack the time series on to the existing EV sales numbers we have for the last few years as reported by EVvolumes.com. In reality, there is a lag between leaving the factory and delivery to the customer, but given this is less than a year, I think it can be safely ignored. I’ve gone only as far as 2023 since we should be able to see evidence of action being taken now in order to obtain outcomes then. To give you a sense of the development process, below is a fascinating presentation by Alex Patterson of Nissan showing you how to get from sketch to production for a new version of the Qashqai. What jumps out at me from this video is that the whole complex process only took three and a half years! And because we are also interested in how many cars were actually sold, here is the same chart looking at those unit numbers. So from my top charts, we were looking for 14 million EV sales in 2023 for Tony’s S curve, which also translates into 5 million units in additional capacity that year. Those numbers compare with Big 6 sales of between 5 and 10 million units per annum. Next, let’s look at the declared intentions of the top six global auto manufacturers. Toyota has been sparring with Volkswagen for the title as world’s number one motor manufacturer for the past few years. When it comes to sustainability, it is well know for its investment in hybrid technology via the Prius and also for pioneering hydrogen fuel cells through the Mirai, but the company has been a laggard when it comes to pure battery electric vehicles (BEVs). Indeed, the company previously pushed the benefits of hybrids far more than pure EVs. On 18 December 2018, however, the company announced a dramatic change of direction (press release here) when it stated that it was targeting 5.5 million EV sales by 2030, of which 1 million would be pure BEVs (not hybrids). “Additionally, by around 2025, every model in the Toyota and Lexus line-up around the world will be available either as a dedicated electrified model or have an electrified option. This will be achieved by increasing the number of dedicated HEV, PHEV, BEV, and FCEV models and by generalizing the availability of HEV, PHEV and/or BEV options to all its models. The commitments by Toyota don’t get us anywhere close to Tony Seba’s 95% EV penetration target in 2030, nor do they accelerate us up the S curve near term. But the central core of Seba’s analysis is that incumbents find it exceedingly difficult to counter disruptive technology since they are loath to junk past sunk costs in the old technology (in Toyota’s case also a bridge technology in hybrids). Indeed, every single one of Tony’s presentations has Kodak’s death at the hands of digital photography at the front of the slide deck pushing this point. In this light, Toyota’s press release can perhaps be seen as reactive rather than proactive. And while Toyota has admitted that there exists a threat from pure EV, their response is measured when compared with arch-rival Volkswagen. It seems VW has decided to go ‘all-in’ with the EV game. Is this an incumbent showing enough flexibility to survive? We shall see. Like Honda and Toyota, Hyundai (and it’s subsidiary Kia Motors) has been somewhat lagging on the electrification of its line-up due to an ongoing commitment to hydrogen fuel cell vehicles. Responding to the aggressive plans announced by Toyota and VW, however, Hyundai announced a $22 billion investment in electric cars in January 2018 and that a new line-up of 31 models by 2020 and 38 models by 2025 . There doesn’t appear to be a specific press release related to their “Clean Mobility” strategy plan, but you can find details in one of Hyundai’s investor presentations here. No EV sales targets have been announced as of this time. The three emblems of the rebirth of the EV have been Tesla’s Model S, the Nissan Leaf and G.M.’s Chevrolet Volt. Yet until October 2nd, 2017, G.M.’s commitment to the EV space appeared half-hearted due to its meagre model line-up. That all changed with this press release. “General Motors announced today how it is executing on a major element of its vision of a world with zero crashes, zero emissions and zero congestion, recently announced by GM Chairman and CEO Mary Barra. Like VW, GM appears to have got the EV religion. In an important move necessary to increase EV penetration, Ford also explained how electrification of existing SUVs and pick-up was to take place, making this comment to Reuters. Rather than a standalone company, Nissan can best be thought of as part of the Nissan-Renault-Mitsubishi Motors alliance. As such the group taken together could be viewed as the largest auto maker in the world. Rather like GM with the Volt, however, Nissan has been somewhat slow to take the technology from its breakout product the Leaf and apply it across its product range. Again I can hear Tony’s voice talking about the lack of ability of incumbents to disrupt their own businesses even when they are leaders in the technology driving the disruption. Moreover, if we assume that the battery materials, battery cells and battery modules will be available to make the cars (I’ll come back to those issues in later posts), the Big 6 makers have the intention to try to sell EVs across every model segment. Thus, on the supply side of Tony Seba’s forecast, the big guys intend to play a major part. Of course, just because you can make an EV, it doesn’t mean anyone will buy it. But that is the demand side, which I also want to leave for later. Rather, for my next post I want to look at the disruptors. How much money can they raise, how many factories can they build, how many EVs can they sell. To date, Tesla sales are really just a rounding error in terms of total global auto sales. Will that change? And, then there are the Chinese. 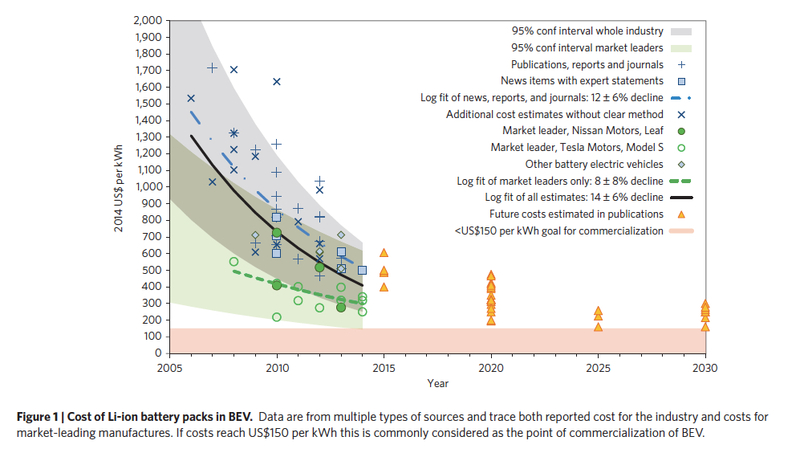 With impeccable timing (for my current blogging theme), Nature Climate Change has just published a commentary by Bjorn Nkyvist and Mans Nilsson reviewing the falling cost of battery packs for electric vehicles (source: here, but apologies as the article is behind a paywall). Bottom line: costs have been falling faster than predicted a few years ago (click for larger image). Battery Banter 1: Are Internal Combustion Engines Going the Way of the Horse? The entire video is worth watching, but today I will restrict myself to the issues he raises relating to battery technology. Seba stresses that technological change in the transport sector could happen at breakneck speed. With a pair of compelling photos of early-last-century New York, we are asked to remember that a grand disruption in transport has happened before. 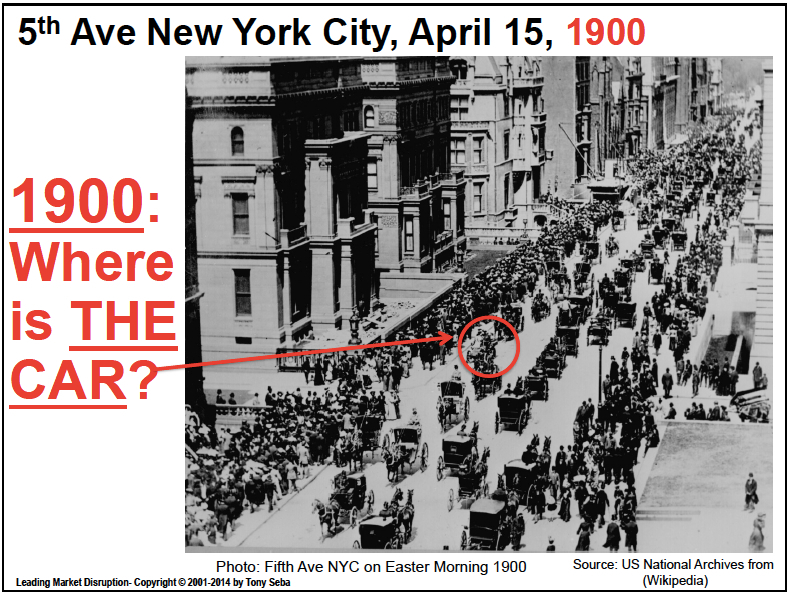 In the first photo, dating from April 1900, we play a game of spot the car (click for larger image). 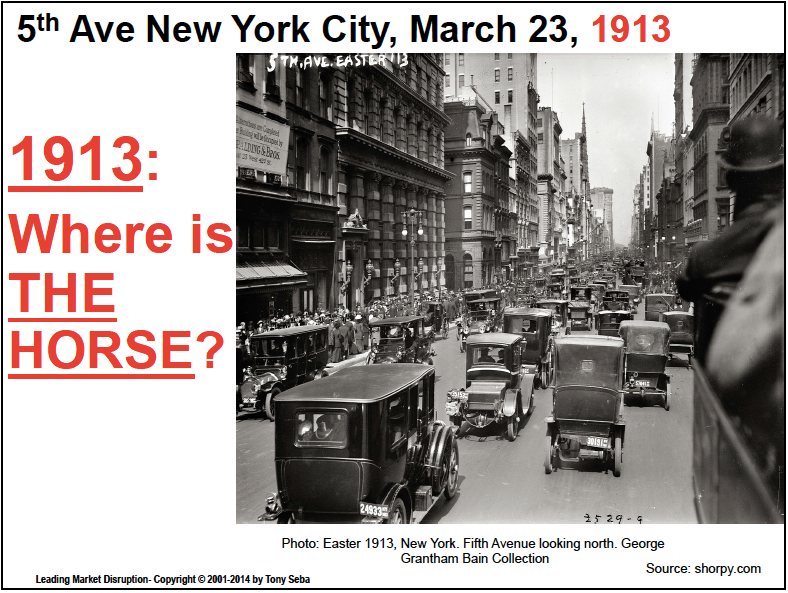 In the second, a mere 13 years later, the challenge is to spot the horse. The lesson here is that once a disruptive technology reaches a particular tipping point, it doesn’t just take market share from the incumbent industry but rather completely replaces it. For Seba, we are close to reaching that point with electric vehicles.